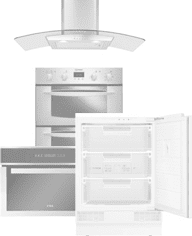 Ovens come in many different types – single, double, electric, gas, and duel-fuel – to name a few. Before making the investment, it’s worth taking the time to research the options available. In this article, we’ll go through the relevant facts, and attempt to demystify the technologies available – so that you’ll be able to choose an oven that’s fit for you and your kitchen. When you’re shopping for an oven, you’ll likely be leaning toward a familiar technology. If you’ve already owned a gas oven, then you might be wary of making a switch to electric, and vice-versa. Having said that, both sorts of oven have their advantages – and it might be that the sort you haven’t yet owned will make a better fit for your kitchen. In terms of energy used, electric and gas ovens are roughly equivalent. However, since gas is cheaper than electricity, a gas oven will cost less in the long run – with the most efficient costing around £15 a year to run, compared with an electric oven, which can cost as much as £50. A dual-fuel cooker combines the best of both worlds, with a gas hob and an electric oven. They’re a popular choice, as they provide the instant-heat of the former with the even cooking and multi-functionality of the latter. If you’re unfamiliar with the world of home cooking equipment, then you might reasonably assume that the terms ‘cooker’ and ‘oven’ are interchangeable, but they actually refer to quite distinct things. 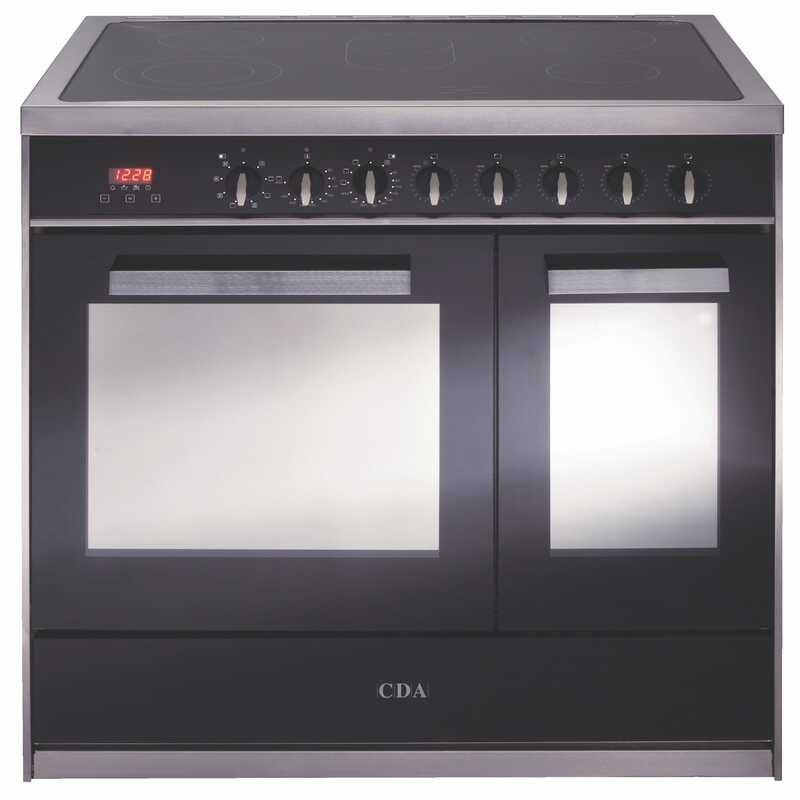 An oven is the compartment where you do your roasting and baking; a cooker is an appliance comprising both an oven and a hob in the same unit. If you buy a separate oven, then you’ll need to buy a separate hob. You might be surprised to learn that buying an oven and hob separately tends to work out cheaper, but you might have quite specific requirements of your kitchen – both practical and aesthetic. A hob that’s built into a worktop might look more at home in your kitchen, and you’ll have greater flexibility when it comes to deciding where to place it. If you’ve ever followed the instructions on a packet of food, then you’ll have noted that the cooking time varies according to whether the oven has a fan or not. Fan-equipped ovens are able to cook the same food at a lower temperature in a shorter space of time. How is this possible? Fan-powered ovens work by blowing heat from the heating element away from the back of the oven, helping the entirety of the oven to quickly reach an even temperature. Moreover, since moving air will be unable to carry moisture, you’ll find that the oven produces less steam. This means you’ll need to adjust the cooking times on meals which you’ve cooked on a fan-less oven in order to avoid overcooking. Some recipes, notably cakes and anything else which relies on moisture, might be better cooked in a non-fan oven, as the moving air will cause the foods to dry more quickly. Some fan ovens will allow you to turn the fan off, allowing you access to the best of both worlds. Buy from our range of high-quality ovens today! Options to suit any budget and interior with fast, free delivery and expert advice. Over time, the interior of an oven will get dirty, with a thin film of grime forming on the interior walls and door. This can be a disgusting sight – but since it’s one that can be avoided, many people put off cleaning until the condition of their oven has deteriorated markedly. Cleaning an oven isn’t just important for aesthetic reasons – a build-up of grease or other flammable substances can present a fire hazard. Even if fires of this sort are too small to spread further than the inside of your oven, they can still produce a huge volume of smoke – which in turn can inflict considerable damage on your home. So why do ovens get so dirty? Well, when you cook food in your oven – whether it be a side of beef or a loaf of bread – you’re causing moisture inside that food to become airborne. When it eventually lands on the inside surface of your oven, it’ll condense. In the process, it’ll take tiny particles of the food you’re cooking – particles which will harden and burn with each subsequent cook, generating unwanted heat. In order to extend the lifespan of your oven, and preserve its cooking power, you’ll want to regularly clean it. For this, you’ll need a specialist oven cleaner that’ll emulsify caked on grime, breaking large globules of fat into smaller droplets. Once the oven cleaner has done its work, you’ll be able to easily wipe away the resulting foam. Obviously, emulsifying agents are poisonous, and so should be kept out of reach of children and pets. Alternatively, many modern ovens come equipped w ith a self-cleaning function that heats the appliance to incredibly high temperatures until the residue within it turns to ash. At that point it can simply be wiped away – no harsh chemicals required. If you’re just buying an oven, then you’ll need to choose between a single oven or a double oven. Single ovens come with just one compartment, while double ovens come with two – each of which can be set to a different temperature. If you’re looking to slow-cook a brisket of beef at 160°C while simultaneously roasting Yorkshire puddings at 200°C, then you’ll be able to do so without worrying about the two interfering with one another. As such, double-ovens are a boon to those looking to cook roast dinners (or other, similarly complicated meals for large gatherings of people). For those that mostly cook for just one or two, a single-oven is probably all you will need. 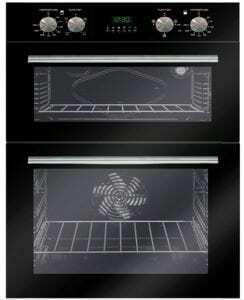 Are ovens a standard size? While ovens come in several different sizes, theses sizes tend to fall into one of several fixed categories – which makes shopping for an oven relatively straightforward. The overwhelming majority of ovens are sixty centimetres wide. Provided you’ve got a space that matches, getting a new oven to physically fit into the space is therefore easy – though connecting it to your gas or electricity supply will almost certainly require expert help.